My knowledge of ancient Greek is not significantly different from zero, but every student of economics at some point runs into oikonomia, the root word from which economy and economics were later derived. For example, in describing the etymology of "economy," the Oxford English Dictionary writes that it derives from "ancient Greek οἰκονομικός practised in the management of a household or family, thrifty, frugal, economical." The first to propose a definition of oikonomia—the management and dispensation of a household—was Xenophon. He did so in the concluding chapter of the theoretical dialogue of the Oikonomikos (the Oikonomikos is composed of two dialogues: the first is theoretical, while the second focuses on the art of oikonomia. ... Xenophon’s definition is composed of four building blocks, or sub-definitions: i) oikonomia as a branch of theoretical knowledge; ii) the oikos as the totality of one’s property; iii) property as that which is useful for life; and iv) oikonomia as the knowledge by which men increase that which is useful for life. Clarifying the meanings of the sub-definitions by a close reading of ancient Greek texts will allow me to argue that the ancient Greek philosophers understood oikonomia as encompassing any activity in which man, when faced with nature’s abundance or excess, acquires a prudent disposition that is translated into practical and theoretical knowledge, in order to comply with his needs and generate surplus. The surplus generated allows man to practice extra economic activities such as politics and philosophy. Excess in the definition proposed is an attribute of nature, which is assumed to be able to meet everyone’s needs and beyond, if economized prudently. Surplus, on the other hand, is the product of people’s prudent economizing of nature’s excess that is not used for securing existence. To get a grip on this earlier notion, it's useful to remember that the idea of a "household" was an expansive one in the times of ancient Greece: indeed, it included all property of the well-to-do in a way that also encompassed what we would now think of as production and firms. This broad idea of the household was called the oikos, which was then viewed as a part of the polis, or public sphere. [Xenophon writes:] "And these too, are slaves, and they are ruled by extremely harsh masters. Some are ruled by gluttony, some by fornication, some by drunkenness, and some by foolish and expensive ambitions which rule cruelly over any men men they get into their power, as long as they see that they are in their prime and able to work . . . mistresses such as I have described perpetually attack the bodies and souls and households all the time that they dominate them." acquired for the sake of existence, its prudent use generates extra-economic surplus. "As can be seen, the problem arising when supplying the needs of the oikos is not how to deal with scarce means. It is, rather, how to set a limit to engaging in economic matters altogether, since nature possess excessive means that can supply all of people’s natural needs, as well as their unnatural desires. On the other hand, if economized prudently, this excess can be used to generate surplus. It can supply the needs of all the inhabitants of one’s oikos or polis, and free some of its members from engaging in economic matters to experience the good life, which is extra-economic." Xenophon’s definition of the oikonomia, as ‘‘a branch of theoretical knowledge . . . by which men can increase household . . . which is useful for life . . .’’ can be reformulated into: oikonomia is the prudent management of the excess found in man and nature in order to allow the practice of a happy life with friends, in politics, and in philosophy. We can see that the two definitions are interchangeable; oikonomia is the management of the oikos. The oikos itself equals wealth, in turn to be defined as everything useful for life. ... The definition of wealth is compatible with the definition of the oikonomia as the prudent management of needs satisfaction in order to generate surplus leisure time (which was perceived by Aristotle as a precondition for the attainment of happiness). "In addition, contemporary literature persuasively presents the oikos as a diversified domain in which there exist all kinds of human relations besides despotic ones. They stress the friendship between husband and wife, it being for the sake of happiness and not just as a means to support the polis, the role of education of children within the household, the different kinds of slaves, the use of other means of communication beside violence, and the household’s existence in and for itself. In this depiction, not only the master, but many participants in the household, can demonstrate virtue, doing so within its bounds." [T]he differences and the resemblance between contemporary and ancient Greek economic theory are rather marked. Both define the economic sphere by the disposition people demonstrate (in the former—of prudence; in the latter—of rationality), which is translated into the theoretical and practical knowledge people demonstrate in economic activity. Moreover, both say that everything that people utilize in order to satisfy their needs/desires and to generate surplus is part of the economic domain, and not (just) material wealth. But, while in ancient economic theory, acquiring this disposition was seen as the expression of an ethical choice, in contemporary theory, the individual’s doing so is taken as a given, so that people’s rational disposition can be inferred from their revealed preferences. The two economic theories embody distinct ontologies: while ancient economic theory held that humans face abundance and excessive means in the economic domain, contemporary economists hold that it is only scarce means that are available there. As for the designation of the surplus generated, in the ancient theory it is a surplus of leisure time that allows the master/citizen to participate in politics and engage in philosophy, while in the contemporary theory ... it is to be turned back to the economic domain, as a source for growth, or, as pointed out by critics of contemporary consumerism, into luxurious consumption. Fresh water doesn't get used up in a global sense: that is, the quantity of fresh water on planet Earth doesn't change. But the way in which the world's fresh water is naturally distributed--by evaporation, precipitation, groundwater, lakes, and rivers and streams--doesn't always match where people want that water to be. The man-made systems of water distribution like dams, reservoirs, pipelines, and irrigation systems can alter the natural distribution of water to some extent. But the American West is experiencing a combination of drought that reduces the natural supply of water and rising population that wants more water. 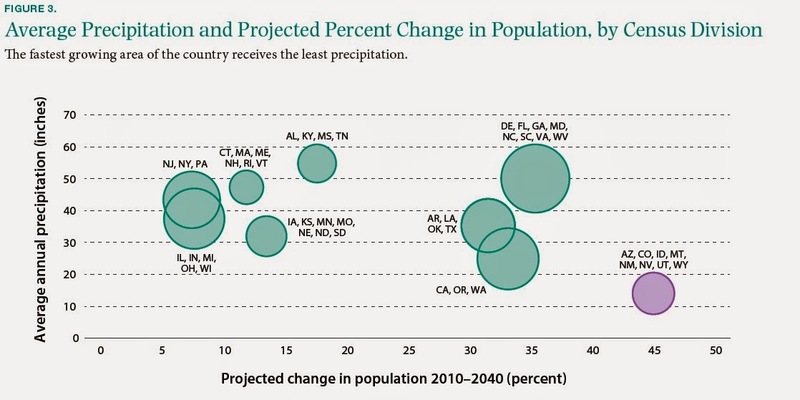 Even with drought, population pressures, and environmental demands for fresh water, there is actually plenty of water in the American Southwest--at least, if the incentives are put in place for some changes to be implement by urban households, farmers, water providers, and legislators. Melissa S. Kearney, Benjamin H. Harris, Brad Hershbein, Elisa Jácome, and Gregory Nantz, "In Times of Drought: Nine Economic Facts about Water in the United States." Newsha K. Ajami, Barton H. Thompson Jr., David G. Victor, "The Path to Water Innovation." Here's my master plan for how to address the water shortfall, drawing on discussions in the various papers. 1) Reduce the incentives for outdoor watering by urban households in dry states. Outdoor watering is the main factor driving the higher use of domestic water per capita in drier states in the West. Whereas residents in wetter states in the East can often rely on rainwater for their landscaping, the inhabitants of Western states must rely on sprinklers. 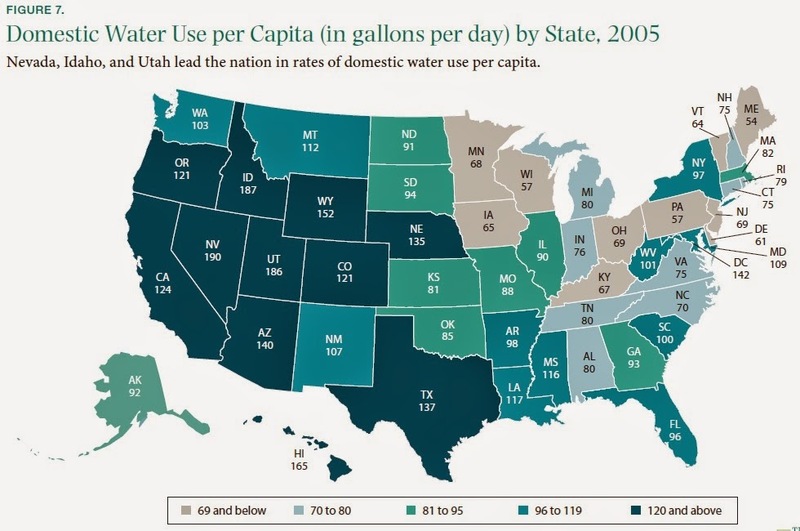 As an example, Utah’s high rate of domestic water use per capita is driven by the fact that its lawns and gardens require more watering due to the state’s dry climate. Similarly, half of California’s residential water is used solely for outdoor purposes; coastal regions in that state use less water per capita than inland regions, largely because of less landscape watering . . . There are a variety of ways to reduce outdoor use of water: specific rules like banning outside watering, or limiting it to certain times of day (to reduce evaporation); the use of drip irrigation and other water-saving technologies; and so on. For economists, an obvious complement to these sorts of steps is to charge people for water in a way where the first "block" of water that is used has a relatively low price, but then additional "blocks" have higher and higher prices. 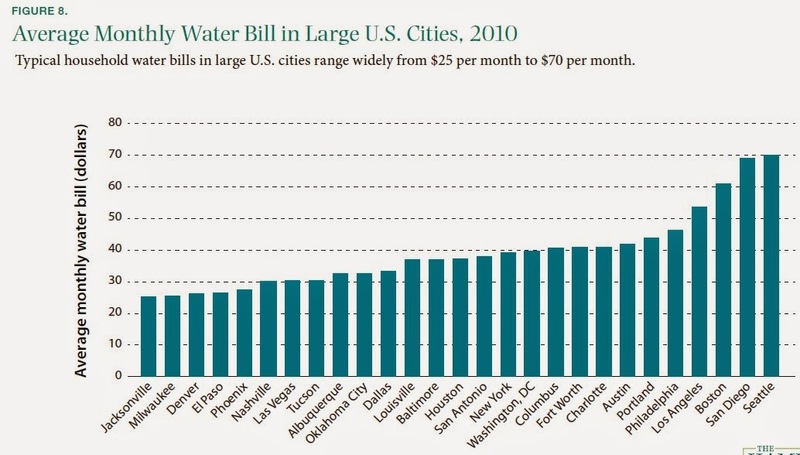 Here's a figure showing average monthly water bills across cities. Los Angeles and San Diego do rank among the cities with higher bills, although the absolute difference is not enormous. But again, the point here is not the average bill, but rather that those who use large amounts of water because they want a green lawn and a washed-down driveway should face some incentives to alter that behavior. 2) Upgrade the water delivery infrastructure. "Water infrastructure, by some measures the oldest and most fragile part of the country’s built environment, has decayed. ... Water infrastructure—including dams, reservoirs, aqueducts, and urban distribution pipes—is aging: almost 40 percent of the pipes used in the nation’s water distribution systems are forty years old or older, and some key infrastructure is a century old. On average, about 16 percent of the nation’s piped water is lost due to leaks and system inefficiencies, wasting about 7 billion gallons of clean and treated water every day .... Metering inaccuracies and unauthorized consumption also leads to revenue loss. Overall, about 30 percent of the water in the United States falls under the category of nonrevenue water, meaning water that has been extracted, treated, and distributed, but that has never generated any revenue because it has been lost to leaks, metering inaccuracies, or the like ... "
3) Let farmers sell some of their water to urban areas. For historical reasons, a very large proportion of the water in many western states, but especially California, goes to agricultural uses. Some of these uses combine relatively high market value and relatively low use of water, like many fruits (including wine grapes), vegetables, and nuts. But the use of water for other crops is more troublesome. Culp, Glennon, and Libecap go into these issues in some detail. As one vivid example, they write: "In 2013, Southern California farmers used more than 100 billion gallons of Colorado River water to grow alfalfa (a very water-intensive crop) that was shipped abroad to support rapidly growing dairy industries, even as the rest of the state struggled through the worst drought in recorded history ..."
There are a substantial number of legal barriers to the idea of farmers trading some water to urban areas, but the possibilities are quite striking. 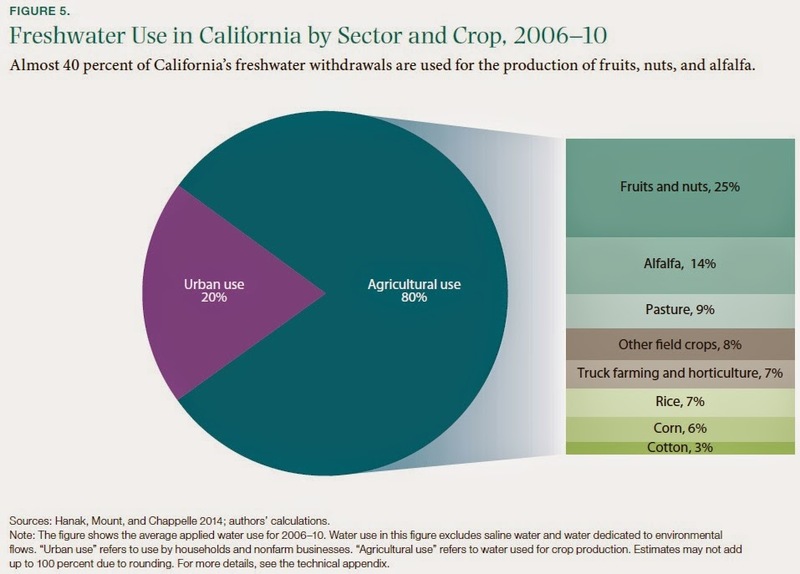 Here's a figure showing that 80% of California's water use goes to agriculture, with a substantial share of that going to lower-value field crops like alfalfa, rice, and cotton. In agricultural areas, as in urban ones, there is often considerable scope for conserving water in various ways, like targeting the use of irrigation more carefully, making sure that irrigation ditches don't leak while carrying water, and the like. Imagine for the sake of argument that it was possible with a comprehensive effort that combined shifting to different crops and water conservation efforts to reduce agricultural water use in California by one-eighth: that is, instead of using 80% of the available water, agriculture would get by with using 70% of the available water. The amount available for urban and/or environmental uses would then rise by half, from 20% to 30% of the available water. One approach they describe, implemented starting in 2002 in Santa Fe, New Mexico, required that any new urban construction had to find a way to offset water that would be used in that construction. 4) Set up groundwater banks. Groundwater has been the saving grace for many parts of the water-starved West. Following the advent of high-lift turbine pump technology in the 1930s, many regions had access to vast reserves of water in underground aquifers that they have tapped to supply water when surface water supplies were inadequate. A recent study looked at data on freshwater reserves above ground and below ground across the Southwest from 2004 to 2013. It found that freshwater reserves had declined by 53 million acre-feet during this time—a volume equivalent to nearly twice the capacity of Lake Mead! The study also found that 75 percent of the decline came from groundwater sources, rather than from the better-publicized declines in surface reservoirs, such as Lake Mead and Lake Powell. Much of this decline occurred because some Western states, including California, have historically failed to regulate, or do not adequately regulate, groundwater withdrawals. As a result, groundwater aquifers are effectively being mined to provide water for day-to-day use. In response to the ongoing drought, California farmers continue to drill new wells at an alarming rate, lowering water tables to unprecedented depths ...In the San Joaquin Valley of California, excessive groundwater pumping caused the water table to plummet and the surface of the earth to subside more than twenty-five feet between 1925 and 1977 ..."
Arizona has already been taking steps toward groundwater protection, both by limiting what can be taken out and by providing incentives to save water in the form of recharging groundwater (which avoids the problem of evaporation). Although not yet developed into a formal exchange, Arizona has been at the cutting edge in developing groundwater recharge and recovery projects and a supporting statutory framework to help enhance the reliability of water supplies. Arizona allows municipal users, industrial users, and various private parties to store water in exchange for credits that they can transfer to other users. Because water stored underground in aquifers is not subject to evaporation, groundwater that is deliberately created through recharge activity can be stored and recovered later. This recharge and recovery approach is facilitated by Arizona laws that restrict the use of groundwater in several of the state’s most important groundwater basins; these restrictions prevent open access to the resource. Restrictions on open access, combined with statutory and regulatory provisions that allow for the creation and recovery of credits, created the essential conditions for trade in stored groundwater. As a result, numerous transactions have occurred between various municipal interests, water providers, and private parties. California passed legislation last month to regulate groundwater pumping for the first time. 5) More research and development on water-saving technologies. As Ajami, Thompson, and Victor discuss at some length, there is relatively little innovative activity in water conservation and purification, as opposed to, say, energy conservation and new sources of energy. They argue that part of the reason is that energy-providing companies compete against each other, while most water companies are sleepy publicly-run local monopolies. Potential entrepreneurs have the ability to look at a lot of ways of producing and using energy, confident that if they come up with something useful, their invention will find a ready market. But entrepreneurs looking at various methods of water conservation will often find that their ideas apply only locally, or are hard to patent, or are hard to sell to water companies and users. 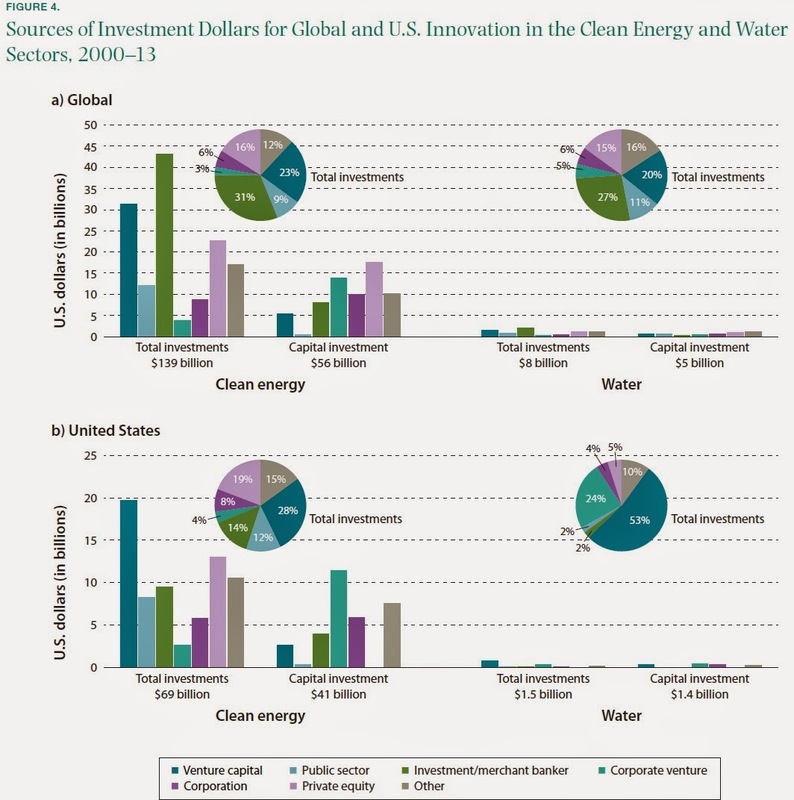 Here's their figure comparing spending for energy and water innovation at a global and U.S. level. 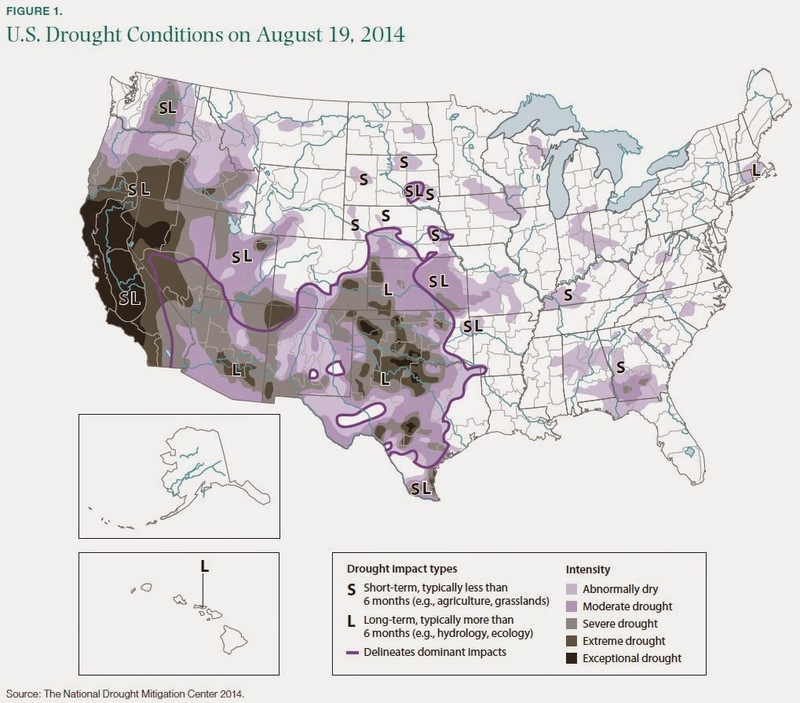 Drought is a natural problem. But the factors that determine how water is available get used represent an economic problem of the incentives and constraints that determine the allocation of a scarce resource. In the American West, the institutional problems of water allocation seem to me even more severe than the natural problem of drought. * Full disclosure: I did comments and editing on the paper by Culp, Glennon, and Libecap, and was paid an honorarium for doing so. Election Day is coming up a week from tomorrow, on Tuesday. Are you voting for your beliefs about the beliefs, character, and skills of the candidates? Or are you voting the party line, one more time? Here's an article I wrote for the Star Tribune newspaper in my home state of Minnesota. I have added weblinks below to several of the studies mentioned. In such a polarized atmosphere, you may want to examine pre-existing biases." Part of the reason American voters have become more polarized in recent decades is that both sides feel better-informed. Similarly, the percentage of Republicans who had unfavorable feelings about the Democratic Party climbed from 68 percent to 82 percent. Most of this increase is due to those who have “very unfavorable” views of other party. Among Democrats, 16 percent of Democrats had “very unfavorable” opinions of the Republican Party in 1994, rising to 38 percent by 2014. Among Republicans, 17 percent had a “very unfavorable” view of the Democratic Party in 1994, rising to 43 percent by 2014. A follow-up poll by Pew in October found that those with more polarized beliefs are more likely to vote. The effort to stir the passions of the ideologically polarized base so that those people turn out to vote explains the tone of many political advertisements. A common response to this increasing polarization is to call for providing more unbiased facts. But in a phenomenon that psychologists and economists call “confirmation bias,” people tend to interpret additional information as additional support for their pre-existing ideas. One classic study of confirmation bias was published in the Journal of Personality and Social Psychology in 1979 by three Stanford psychologists, Charles G. Lord, Lee Ross and Mark R. Lepper. In that experiment, 151 college undergraduates were surveyed about their beliefs on capital punishment. Everyone was then exposed to two studies, one favoring and one opposing the death penalty. They were also provided details of how these studies were done, along with critiques and rebuttals for each study. The result of receiving balanced pro-and-con information was not greater intellectual humility — that is, a deeper perception that your own preferred position might have some weaknesses and the other side might have some strengths. Instead, the result was a greater polarization of beliefs. Student subjects on both sides — who had received the same packet of balanced information! — all tended to believe that the information confirmed their previous position. A number of studies have documented the reality of confirmation bias since then. In an especially clever 2013 study, Dan M. Kahan (Yale University), Ellen Peters (Ohio State), Erica Cantrell Dawson (Cornell) and Paul Slovic (Oregon) showed that people’s ability to interpret numbers declines when a political context is added. Their study included 1,100 adults of varying political beliefs, split into four groups. The first two groups received a small table of data about a hypothetical skin cream and whether it worked to reduce rashes. Some got data suggesting that the cream worked; others got data suggesting it didn’t. But people of all political persuasions had little trouble interpreting the data correctly. The other two groups got tables of data with exactly the same numbers. But instead of indicating whether skin cream worked, the labels on the table now said the data was showing a number of cities that had enacted a ban on handguns, or had not, and whether the result had been lower crime rates, or not. Some got data suggesting that the handgun ban had reduced crime; others got data suggesting it didn’t. The data tables were identical to the skin cream example. But people in these groups became unable to describe what the tables found. Instead, political liberals and conservatives both tended to find that the data supported their pre-existing beliefs about guns and crime — even when it clearly didn’t. In short, many Americans wear information about public policy like medieval armor, using it to ward off challenges. Of course, it’s always easy to define others as hyperpartisans who won’t even acknowledge basic facts. But what about you? One obvious test is how much your beliefs change depending on the party of a president. For example, have your opinions on the economic dangers of large budget deficits varied, coincidentally, with whether the deficits in question occurred under President Bush (or Reagan) or under President Obama? Is your level of outrage about presidents who push the edge of their constitutional powers aimed mostly at presidents of “the other” party? What about your level of discontent over government surveillance of phones and e-mails? Do your feelings about military actions in the Middle East vary by the party of the commander in chief? Do you blame the current gridlock in Congress almost entirely on the Republican-controlled House of Representatives or almost entirely on the Democratic-controlled Senate? Did you oppose ending the Senate filibuster back in 2006, when Democrats could use it to slow down the Republicans, but then favor ending the filibuster in 2014, when Republicans could use it to slow down Democrats? Or vice versa? Do big-money political contributions and rich candidates seem unfair when they are on the other side of the political spectrum, but part of a robust political process and a key element of free speech when they support your preferred side? Do you complain about gridlock and lack of bipartisanship, but then — in the secrecy of the ballot box — do you almost always vote a straight party ticket? Of course, for all of these issues and many others, there are important distinctions that can be drawn between similar policies at different times and places. But if your personal political compass somehow always rotates to point to how your pre-existing beliefs are already correct, then you might want to remember how confirmation bias tends to shade everyone’s thinking. When it comes to political beliefs, most people live in a cocoon of semi-manufactured outrage and self-congratulatory confirmation bias. The Pew surveys offer evidence on the political segregation in neighborhoods, places of worship, sources of news — and even in who we marry. Being opposed to political polarization doesn’t mean backing off from your beliefs. But it does mean holding those beliefs with a dose of humility. If you can’t acknowledge that there is a sensible challenge to a large number (or most?) of your political views, even though you ultimately do not agree with that challenge, you are ill-informed. But most moderates are not radical. Instead, they are often turned off and tuned out from an increasingly polarized political arena. The phrase "Keeping Up with the Joneses" seems to have become firmly established in U.S. culture as a result of a prominent comic strip by that name which started in 1913 and ran for several decades. Characters in the cartoon often referred to what the Joneses were doing but you never met them. Usually the term refers to a desire to imitate the higher and more conspicuous consumption levels of one's neighbors. But can a desire to follow the neighbors also be harnessed to energy conservation efforts? 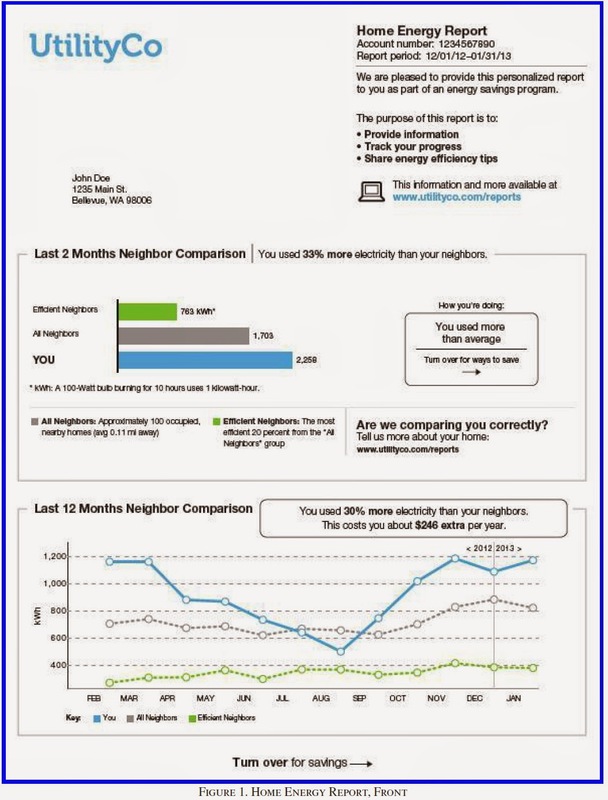 We study a widely-implemented and highly-publicized behavioral intervention, the “home energy report” produced by a company called Opower.The Opower reports feature personalized energy use feedback, social comparisons, and energy conservation information, and they are mailed to households every month or every few months for an indefinite period. 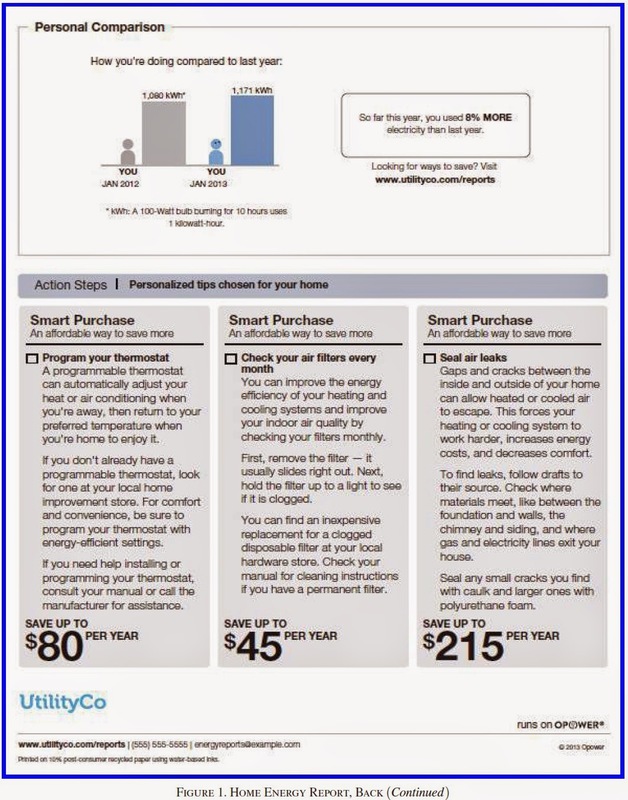 Utilities hire Opower to send the reports primarily because the resulting energy savings help to comply with state energy conservation requirements. There are now 6.2 million households receiving home energy reports at 85 utilities across the United States. At first, there is a pattern of “action and backsliding”: consumers reduce electricity use markedly within days of receiving each of their initial reports, but these immediate efforts decay at a rate that might cause the effects to disappear after a few months if the treatment were not repeated. Over time, however, the cyclical pattern of action and backsliding attenuates. After the first four reports, the immediate consumption decreases after report arrivals are about five times smaller than they were initially. For the groups whose reports are discontinued after about two years, the effects decay at about 10 to 20 percent per year—four to eight times slower than the decay rate between the initial reports. This difference implies that as the intervention is repeated, people gradually develop a new “capital stock” that generates persistent changes in outcomes. This capital stock might be physical capital, such as energy efficient lightbulbs or appliances, or “consumption capital”—a stock of energy use habits ... Strikingly, however, even though the effects are relatively persistent and the “action and backsliding” has attenuated, consumers do not habituate fully even after two years: treatment effects in the third through fifth years are 50 to 60 percent stronger if the intervention is continued instead of discontinued. One reason for having utilities encourage energy conservation is because it can be cheaper than building additional electricity generation plants, and facing the broader social costs of the environmental costs of such plants. Electricity in the US across all sectors of the economy now costs about 11 cents per kilowatt/hour, Thus, Allcott and Rogers look at the cost-effectiveness of sending Opower reports, defined "as the cost to produce and mail reports divided by the kilowatt-hours of electricity conserved." They find that a one-shot Opower notice has has a cost effectiveness of 4.31 cents/kWh. Extending the intervention to two years costs more in sending out additional notices. But the continual reminders keep encouraging people to conserve, and also over that time people build up a pattern of reduced energy consumption. In their words, "The two-year intervention is much more cost effective than the oneshot intervention, both because people have not habituated after the first report and because the capital stock formation process takes time." Thus, the overall cost-effectiveness after about two years is about 1.5 cents/kWh. After two years, it seems possible to slack off on the reminders, and to send them perhaps twice a year rather than with every monthly bill. This step reduces the cost of sending the reminders, but seems to keep about the same level of effectiveness in terms of holding down energy consumption. Indeed, households don't seem to get used to the reports, but seem to keep responding to the notices even after a third and fourth year. As they write: "However, it is remarkable how little cost effectiveness decreases after two years, suggesting strikingly little habituation." I'm not surprised that these kinds of notices about how much electricity the Joneses are using have a short-run effect. But the surprise in these results is that people keep chasing the Joneses toward greater electricity conservation even after several years of receiving these notices. It makes one wonder if there aren't some other ways in which information and social pressure, discreetly and privately applied, might be used in the service of environmental goals. In a globalizing world economy, it's perhaps no surprise that mergers and acquisitions are also crossing national borders more frequently--and that the risk of cartel-like behavior across national borders is also rising. The OECD lays out some background in its recent report, "Challenges of International Co-operation in Competition Law Enforcement." As a starting point, here's a figure showing the overall upward pattern cross-border merger and acquisition deals in recent decades. In some cases, these M&A deals raise eyebrows on their own. In other cases, there is a concern that companies may be acting together across borders in a cartel-like way without an explicit deal. Indeed, the number of international cartels that have been discovered has been rising in recent years. 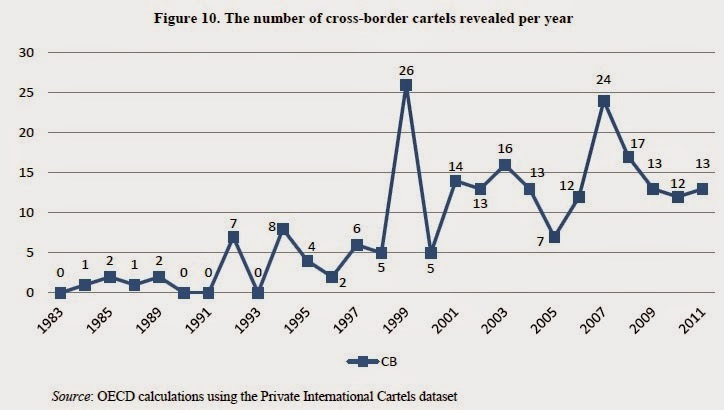 "The number of cross-border cartels revealed in an average year has increased substantially since the early 1990s. 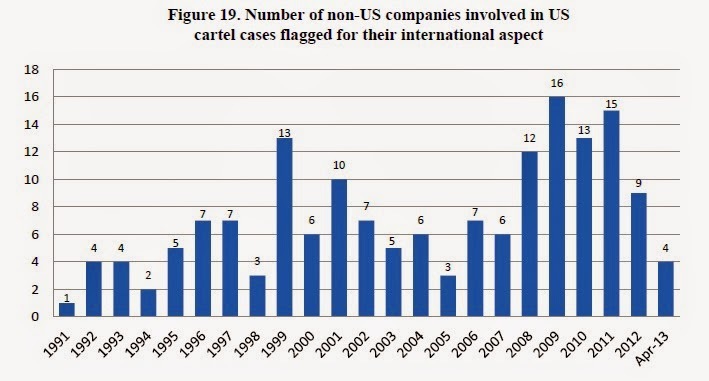 According to the Private International Cartel (PIC) database,34 about 3 cross-border cartels were revealed via competition authority decisions or prosecutions in an average year between 1990 and 1994. In recent years, from 2007 to 2011, an average of about 16 cross-border cartels has been revealed per year." The last two decades have seen a rise in the number of countries with "competition laws" and antitrust authorities to enforce them. "The spread of competition law enforcement around the world has been remarkable. At the end of the 1970s only nine jurisdictions had a competition law, and only six of them had a competition authority in place. By 1990, there were 23 jurisdictions with a competition law and 16 with a competition authority. 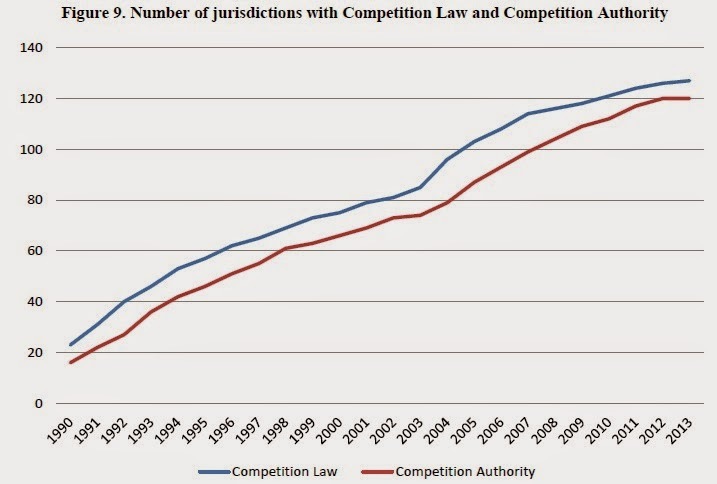 The number of jurisdictions with competition authorities increased more than 500% between 1990 and 2013. As of October 2013, about 127 jurisdictions had a competition law, of which 120 had a functioning competition authority. ... The speed and breadth of the proliferation of competition laws and competition enforcers around the globe is the single most important development in the competition area over the last 20 years." A main focus of the OECD report is the issues involved in coordinating the actions of competition authorities, who often have different legal standards, and I suspect in many cases may be more confrontational toward foreign companies than toward domestic firms. The U.S. is an active player in this area. "According to Scott Hammond (former Deputy Assistant Attorney General for Criminal Enforcement), the Antitrust Division typically has approximately 50 international cartel investigations open at a time. Since May 1999, more than 40 foreign defendants have served, or are serving, prison sentences in the United States for participating in an international cartel or for obstructing an investigation of an international cartel. Foreign nationals from France, Germany, Japan, the Republic of Korea, Norway, the Netherlands, Sweden, Switzerland, Chinese Taipei and the United Kingdom are among those defendants. In the well-known vitamins case of 1999, for example, twelve individuals, including six European executives, were sentenced to serve time in US prisons for their role in the vitamin conspiracy. The automotive parts investigations exemplify the need for the Antitrust Division to co-operate with foreign counterparts. The investigation included search warrants executed on the same day and conducted at the same time as searches by enforcers in other countries. During the ongoing investigation the Antitrust Division coordinated with the competition law authorities of Japan, Canada, the Republic of Korea, Mexico, Australia, and the European Commission." 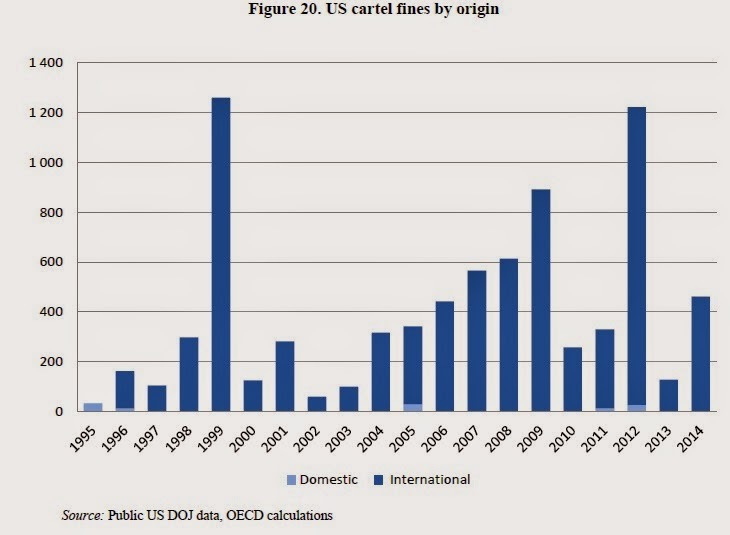 The number US Department of Justice antitrust cases with an international dimension has been rising over time. Indeed, international cases have for some years made up most of the fines collected by U.S. antitrust enforcement agencies. Here's a figure showing the number of non-U.S. companies prosecuted in cartel investigations by the U.S. antitrust authorities, and the share of antitrust fines received from these cases. When companies act together to limit competition and to carve up global markets, it is just as harmful as when they do so in domestic markets--but it can be harder to monitor and enforce. The battle is already underway. Consider three ways in which a society or culture can deprive women of their ability to make their own decisions: the society can deny women control over household resources, it can condone wife-beating, and it can allow child marriage. 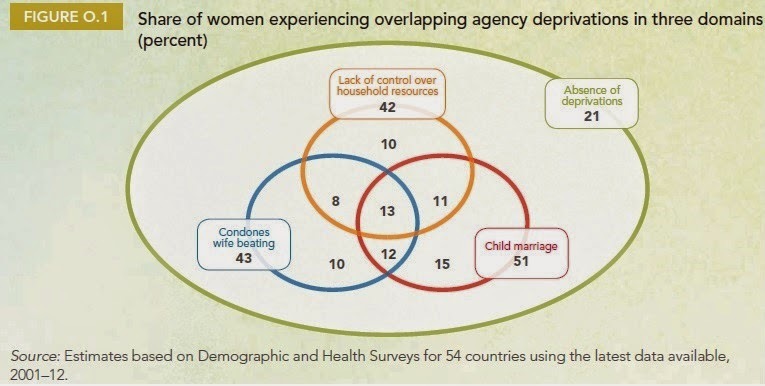 According to a World Bank analysis of 54 developing countries 13% of women in these countries experience all three of these deprivations, and only 21% experience none of them. and Julieth Santamaria. Here is the list of 54 countries, by region: "East Asia and Pacific (Cambodia, Indonesia, the Philippines, Timor-Leste); Europe and Central Asia (Albania, Armenia, Azerbaijan, Moldova, Ukraine); Latin America and the Caribbean (Bolivia, Colombia, the Dominican Republic, Guyana, Haiti, Honduras, Nicaragua, Peru); Middle East and North Africa (Arab Republic of Egypt, Jordan, Morocco); South Asia (Bangladesh, India, Maldives, Nepal); Sub-Saharan Africa (Benin, Burkina Faso, Burundi, Cameroon, the Democratic Republic of Congo, the Republic of Congo, Côte d’Ivoire, Ethiopia, Gabon, Ghana, Guinea, Kenya, Lesotho, Liberia, Madagascar, Malawi, Mali, Mozambique, Namibia, Niger, Nigeria, Rwanda, São Tomé and Príncipe, Senegal, Sierra Leone, Swaziland, Tanzania, Uganda, Zambia, Zimbabwe)." Middle East and North Africa and South Asia—had 10 or more differences. In 26 countries, statutory inheritance laws differentiate between women and men. In 15 countries, women still require their husbands’ consent to work. Other laws limit women’s agency in marriages and family life." 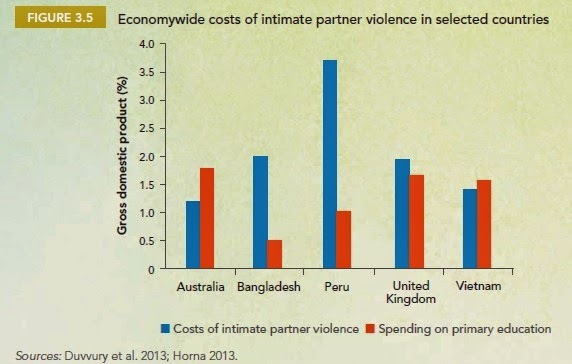 "Different models have been developed to estimate the economywide costs of IPV [intimate partner violence]. Although these models vary in their core assumptions, they generally take into account some combination of direct and indirect costs that are both tangible (and can be monetized) and intangible (which cannot be readily monetized). These estimates typically include costs related to service provision, out-of-pocket expenditures, and lost income and productivity. IPV incurs direct costs on services in the health, social service, justice, and police sectors. ... Women exposed to partner violence in Vietnam have higher work absenteeism, lower productivity, and lower earnings than working women who are not beaten ... In Tanzania, women in formal wage work who are exposed to severe partner abuse (both lifetime and current) have 60 percent lower earnings." Studies done in various countries suggest that the social cost of intimate partner violence can be comparable to or exceed what is spent on primary schooling in that country. Child marriage in developing countries remains pervasive, with one-third of girls being married before age 18 and one in nine being married before age 15 ... If present trends continue, more than 142 million girls will be married before the age of 18 in the next decade. And each year, almost one in five girls in developing countries become pregnant before age 18. The lifetime opportunity costs of teen pregnancy have been estimated to range from 1 percent of annual gross domestic product in China to as much as 30 percent in Uganda, measured solely by lost income. In developing countries, pregnancy-related causes are the largest contributor to the mortality of girls ages 15 to 19—nearly 70,000 deaths annually. "In Turkey, for example, extending the compulsory education age by three years changed parents’ and girls’ aspirations for the future—in just five years, the share of 15-year-old girls who were married fell by 50 percent and the probability of giving birth by age 17 fell by 43 percent ... Increasing incentives for girls’ schooling through CCTs [conditional cash transfers] can be an effective way to tackle regressive gender norms. This approach has been successful in Bangladesh, Pakistan, and Turkey, for example. ... Benefits to girls of staying in school can extend beyond the value of educational attainment, enhancing their agency in other ways as well. For example, in Malawi, a CCT targeting 13- to 22-year-old girls and women led to recipients staying in school longer and to significant declines in early marriage, teenage pregnancy, and self-reported sexual activity ..."
Opportunities for women to have paid work outside the home can also make a difference: "Expanding economic opportunities is a major policy challenge. Opportunities for women to work are opening up slowly at best in most regions—globally, women’s labor force participation has actually fallen slightly since 1990, from 57 percent to 55 percent." Many of these changes will be facilitated or supported as women come to play a larger role in political institutions. 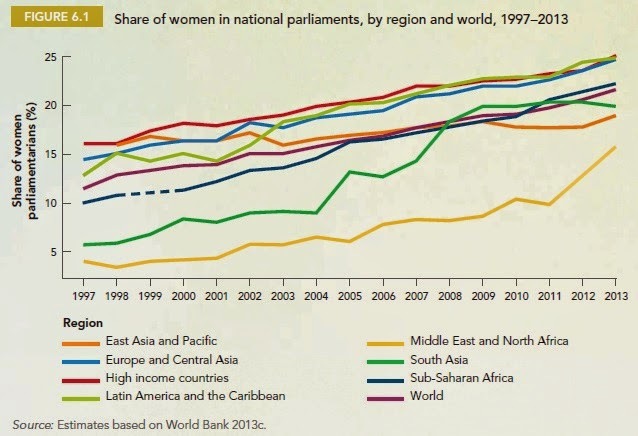 As one example, the share of women in national parliaments has been rising in all regions of the world over the last couple of decades, as shown in the figure below. But glance over at the vertical axis, and you see that in no region does the share of women in the national parliament exceed 25%. According to the American Council of Trustees and Alumni, a non-profit that seeks to stir up higher education, there are seven subjects "essential to a liberal arts education: literature, composition, economics, math, intermediate level foreign language, science, and American government/history." Thus, they decided to look at the graduation requirements of about 1100 U.S. colleges and universities, and see if or how the requirements matched their seven categories. Of course, these kinds of counts are always dependent on the categories chosen, and the categories can be argued. My guess is that a number of schools might have, for example, a "social science" requirement rather than an "economics," or perhaps an overall history requirement rather than a "U.S history/government" requirement. Personally, I'm not the biggest fan of the old-time requirement for learning a foreign language, although that's an argument for another day. As I mentioned, ACTA likes to stir the pot. That said, a list of requirements tells you something about what common experiences and subjects you can reasonably expect every college graduate to know something about. It tells you something about the willingness of colleges and universities to nudge students just a bit out of their comfort zone. So it's bothersome to me that at about 80% of U.S. colleges and universities, students who wish to do so can avoid taking any economics, or any U.S. history and government. number killed by Islamist extremist terrorists since 9/11 is 19, or fewer than 2 per year. That is a far cry, of course, from 6,000 to 7,000 per year. A defender of the spending might argue that the number is that low primarily because of the counterterrorism efforts. Others might find that to be a very considerable stretch. An instructive comparison might be made with the Los Angeles Police Department, which operates with a yearly budget of $1.3 billion. Considering only lives saved following the discussion above, that expenditure would be justified if the police saved some 185 lives every year when each saved life is valued at $7 million. (It makes sense to use the lower figure for the value of a saved life here, because police work is likely to have few indirect and ancillary costs: for example, a fatal car crash does not cause others to avoid driving.) At present, some 300 homicides occur each year in the city and about the same number of deaths from automobile accidents. It is certainly plausible to suggest that both of those numbers would be substantially higher without police efforts, and accordingly that local taxpayers are getting pretty good value for their money. Moreover, the police provide a great many other services (or “cobenefits”) to the community for the same expenditure, from directing traffic to arresting burglars and shoplifters. Mueller and Stewart push for thinking about terrorism as one risk among many risks. 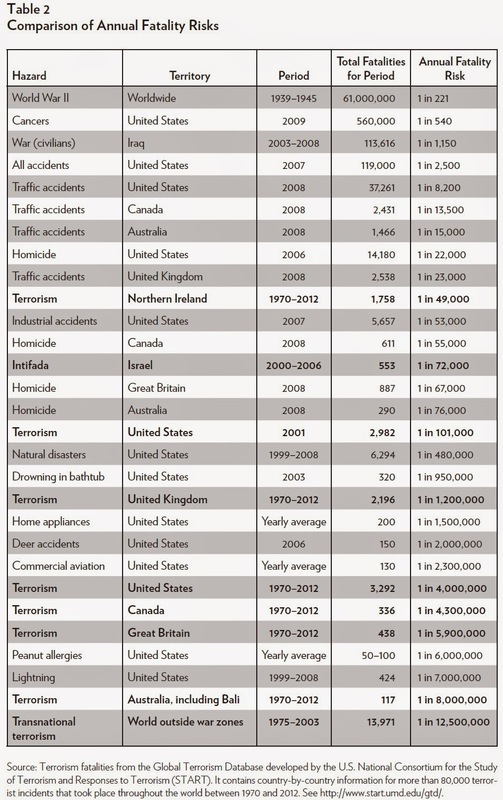 For example, here's an table showing the risk of death from various causes over various time periods. Of course, terrorism is arguably a more frightening or terrible risk than other risks, and thus one can make a plausible-if-arguable case that it's worth spending more to save 100 lives from terrorist attacks than it is worth to save 100 lives from, say cancer or industrial accidents or traffic deaths. But saying that it makes sense to spend "more" against terrorism risks is not the same as arguing that terrorism risks should get a blank check. 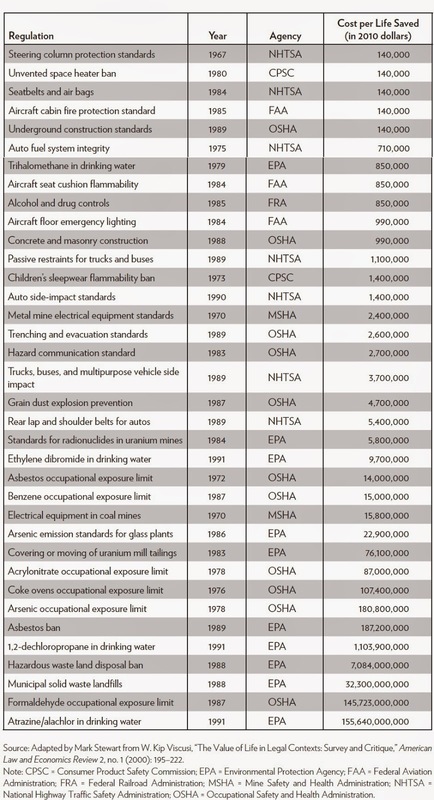 Mueller and Stewart also offer a cost-per-life-saved chart, which mixes together estimates of the effects of a number of past regulatory actions. One can quarrel with the specifics of these estimates in various ways. But overall, a sensible regulatory system should be seeking out ways to do more of the kinds of items that offer higher ratios of benefits to costs, and scaling back on the items that offer lower ratios of benefits to costs. Of course, this doesn't mean that all or even most counterterrorism spending is socially undesirable. But it does mean that when thinking about counterterrorism spending, we should be on the lookout for areas where resources might be redeployed more effectively. As one concrete example, Mueller and Stewart point out, the "Transport Security Administration’s Federal Air Marshal Service and its full body scanner technology together are nearly as costly as the entire FBI counterterrorism budget, but their risk reduction over the alternatives appears to be negligible." It involves the risk that body scanners using x-ray technology will cause cancer. Asked about it, the DHS official in charge, John Pistole, essentially said that, although the cancer risk was not zero, it was acceptable. ... Since the radiation exposure delivered to each passenger is known, one can calculate the risk of getting cancer from a single exposure using a standard approach that, although controversial, is officially accepted by nuclear regulators in the United States and elsewhere. On the basis of a 2012 review of scanner safety, that cancer risk per scan is about 1 in 60 million. As it happens, the chance that an individual airline passenger will be killed by terrorists on an individual flight is much lower—1 in 90 million. ... [T]he risk of being killed by a terrorist on an airliner is already fully acceptable by the standards applied to the cancer risk from body scanners using x-ray technology. But no official has drawn that comparison. As Mueller and Stewart point out, we have in fact eased many rules about airplane travel in recent years, without people freaking out. For example, no one any longer asks if you packed your bag yourself and have had it with you at all time. Since 2005, air passengers have (technically) been allowed to take short scissors and knives on planes. Passenger no longer need to show identification at the airplane gate. The color-coded "alert" scheme has been ended. There has been a hiring freeze on "air marshalls" since 2012. The young (under 13) and the old (over 74) no need to take off their shoes when going through screening. The PreCheck system is allowing as many as half of all flyers, including many frequent flyers, to go through airport security without taking off their belts and shoes and jackets and removing liquids and laptops from their bags. But despite these changes, in the U.S. as a whole, our approach to counterterrorism seems to largely ignore cost-benefit analysis. Indeed, Mueller and Steward cite a 2010 report done by a panel of outside experts making this point. Other countries seem able to make different choices about counterterrorism spending. High textbook prices are a pebble in the shoe of many college students. Sure, it's not the biggest financial issue they face, But it's a real and nagging annoyance that for hinders performance for many students. 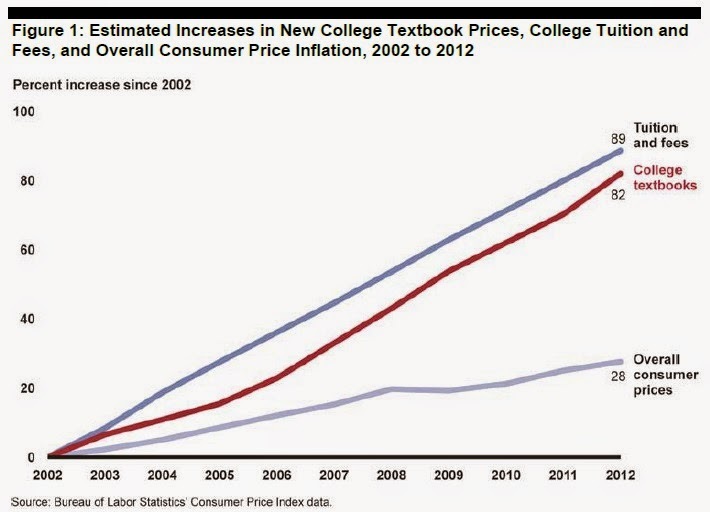 In 2005, based on data from the Bureau of Labor Statistics, we reported that new college textbook prices had risen at twice the rate of annual inflation over the course of nearly two decades, increasing at an average of 6 percent per year and following close behind increases in tuition and fees. More recent data show that textbook prices continued to rise from 2002 to 2012 at an average of 6 percent per year, while tuition and fees increased at an average of 7 percent and overall prices increased at an average of 2 percent per year. had foregone purchasing a textbook were concerned that doing so would hurt their grade in a course. ... Nearly half of all students surveyed said that the cost of textbooks impacted how many/which classes they took each semester. David Kestenbaum and Jacob Goldstein at National Public Radio took up this question recently on one of their "Planet Money" podcasts. They say: ""By popular demand: Why are textbooks so expensive?" For economists, a highlight is that they converse with Greg Mankiw, author of what is currently the best-selling introductory economics textbook, which as they point out is selling for $286 on Amazon. Maybe this is a good place to point out that I am not a neutral observer in this argument: The third edition of my own Principles of Economics textbook is available through Textbook Media. The pricing varies from $25 for online access to the book, up through $60 for both a paper copy (soft-cover, black and white) and online access.